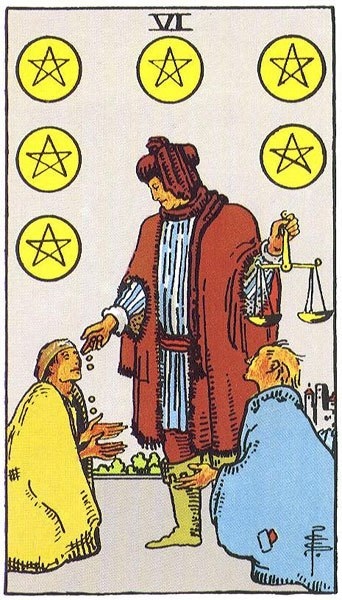 Image courtesy of the RWS tarot. Note the scales! Benefic Jupiter has just passed over Fixed Star Zubeneschemali for a second time due its current retrograde motion – Zubeneschemali represents the North Scale of the constellation Libra and Jupiter passing over it is considered a fortunate influence for writing and public speaking, for finding favor with the courts or clergy, and gaining influential friends. * Because there’s also a South Scale (its counterpart Zubenelgenubi; situated about 4 degrees earlier in the zodiac), when I first started learning about the Fixed Stars and their effects it was easy to mix the two up. So I came up with a nifty little mnemonic device to help me remember which was which – “The North is nice”. The North Scale of Libra – which actually used to be the pincers of Scorpio until mankind decided to re-assign this parcel of celestial real estate – is considered the fortunate stellar influence of the two. It was thought to be “The Full Price” side of Libra’s money-weighing scale. By contrast, The South Scale – Zubenelgenubi – is the Insufficient Price of decidedly malefic nature. There’s nothing not to like about the North Scale, though – “It gives good fortune, high ambition, beneficence, honor, riches, and permanent happiness.” * Love that last bit – “permanent happiness”….! It has a nice ring to it, doesn’t it? Jupiter passes over this point for a third and final time during September’s second week; a blessing from the heavens if you need to give any kind of presentation, if you’re working on a research paper, thesis, or novel, and certainly if you could use a little help from friends in high places. Sagittarius and Pisces benefit strongly from this energy since Jupiter is the ruling planet of both signs (Modern vs. Traditional rulership), as do Scorpios born near the 10th of November and/or those with planets/points around the 19 degree mark of Scorpio. Next ›Welcome, Uranus in Taurus!